The triangle square blocks in Essex are a bit larger than your typical triangle square unit. Jenny demonstrates how to mark the lines when the larger Fons & Porter Quarter Inch Seam Marker is too short to go across the entirety of the square. She then demonstrates completing the block. 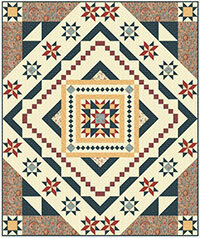 The sawtooth star quilt blocks involve a lot of flying geese, and Jenny shows how to make quick-pieced or fast flying geese using the four-at-a-time method. Both Fons & Porter Quarter Inch Seam Markers are long enough to mark the squares used for the geese, so Jenny uses the smaller of the two to mark the “sky” patches of the flying geese units. Once the flying geese units are complete, it’s time to finish the sawtooth star block, and Jenny demonstrates how to do so while maintaining accurate points on your triangles.